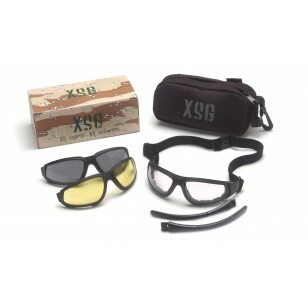 Pyramex GB4010KIT Black Frame/Clear Ballistic, Gray Ballistic And Amber Ballistic Interchangeable Anti-Fog Lenses. Black Ballistic Nylon Case For Storage. Interchangeable Temples Included. Black Frame/Clear Ballistic, Gray Ballistic And Amber Ballistic Interchangeable Anti-Fog Lenses. Black Ballistic Nylon Case For Storage. Interchangeable Temples Included.